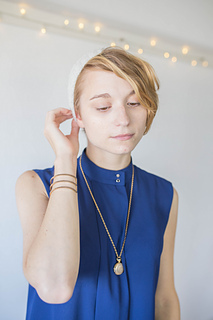 A: 18”, B” 7” (when relaxed), A: can fit heads 20-24”, B: 8”-9” (when worn). 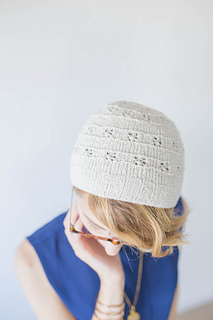 This pattern is part of the Fibre Muse GIVER 2017 Issue! 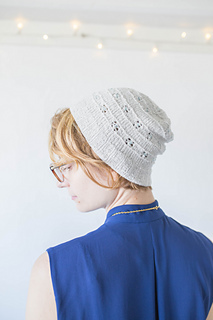 To purchase the entire pattern collection or to subscribe, click here to learn more. 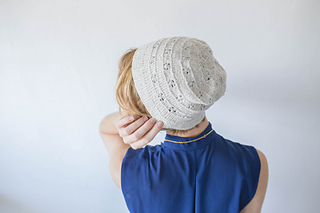 Snow served as the main inspiration for this hat’s design. 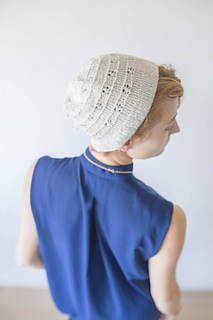 In-between simple sections of stockinette stitch lay snowflake eyelet patterns. The single bead in the middle makes these stitches shine and glisten in the sunlight. The relationship between snowflakes and snow are very similar to stitches and the final piece. At first glance, on its own, a snowflake doesn’t seem that important. But for anyone who has experienced a snowfall, now powerful hundreds of thousands, millions even, of individual snowflakes can affect a landscape. And just like how one stitch doesn’t seem like much, hundreds and thousands of stitches culminate together to form a landscape of their own: a knitted piece. Taking a closer look at a snowflake, you realize that they are all unique from each other, just like how one stitch is different from the next. The difference in tension, the way you knit it, the color change, even the environment surrounding its creation process, that is what makes each stitch unique. 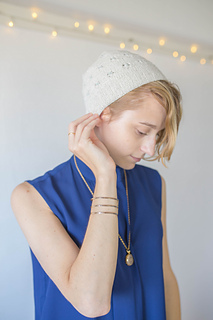 This hat serves as a reminder of your power as an individual. You are like the snowflake and that stitch. You are unique, and there is no one like you. It may seem like on your own you can’t do much, but it is important to remember your power. For movements are made up of individual, unique people. As Giver Fibre Muses, we believe in the power of individual acts culminating into something more significant. 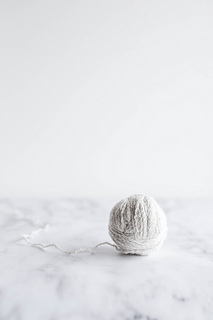 We make part of a movement is one where we believe that our work and art as knitters can make a difference in the lives of others. 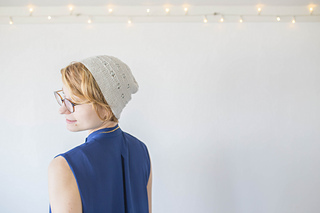 This hat is the perfect Giver project as it makes for an excellent gift for someone knit-worthy (that includes you). By focusing on one central design element, a beaded snowflake, it creates universal appeal and can be easily paired up with your favourite yarn. To make it extra special though, work it up in a skein of Feel Good Yarn Company’s SilverSpun Sock. 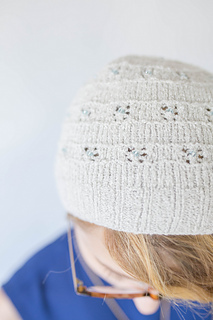 The silver in the fibre gives the hat an extra twinkle, just like fresh snow on a sunny day. How will you transform the Snowfall Hat into meaningful experiences and moments? Yarns Used: Feel Good Yarn Company SilverSpun Sock (Sock; 87% Combed Cotton, 5% Silver, 5% Nylon, 3% Spandex; 450 yds). 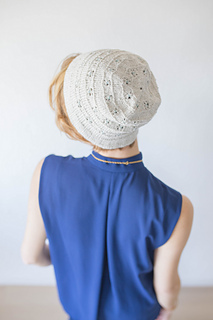 One skein in Natural. Needle: US7 (4.5mm) 16” (40 cm) circular needle, US7 (4.5mm) DPNs. Yardage: 225 yds (206 meters). Gauge: 26.5 sts and 36 rows = 4” (10 cm) in St. st after blocking. If you are using the Silver Spun yarn, note this is an extremely stretchy and elastic yarn. 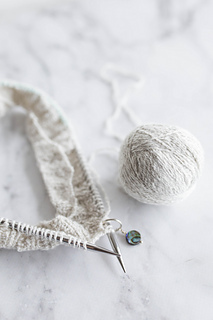 When working on the pattern, determine your gauge accuracy by stretching the work to see if it matches gauge when stretched. 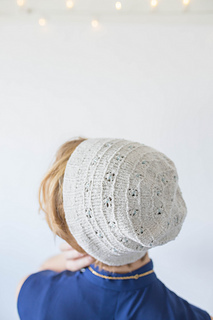 The yarn will stretch comfortably to your head but will retain its original shape when relaxed. 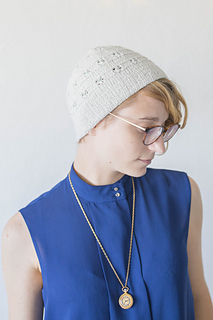 If you want your hat to be a slouchie instead of a beanie, work 24 sts = 4” (10cm). Other Notions: Darning needle, stitch markers, 53 4mm beads, size 14 (0.6mm) crochet hook. Final Measurements: A: 18”, B” 7” (when relaxed), A: can fit heads 20-24”, B: 8”-9” (when worn).